Are Godzilla, Ghidorah, Mothra & Rodan in Kong: Skull Island? Last week, after Kong: Skull Island started screening for members of the press, it was revealed that the movie has a post-credit scene, although it wasn't know at the time what this footage showed. It didn't take long for fans to speculate that the scene could serve as a tease for Godzilla: King of Monsters, which is slated to hit theaters on March 22, 2019. Today, we have (what could be) proof that this stinger does tie into Godzilla 2, which will ultimately lead into Godzilla vs. Kong on May 29, 2020. There will be potential SPOILERS below, so read on at your own risk. A SciFied reader alerted the site to the final credits for Kong: Skull Island being posted at Sci-fi Japan, which features what likely is confirmation that the post-credit scene will lead into Godzilla: King of Monsters. Buried deep within the credits is a brief statement that acknowledges four creature cameos are featured somewhere in the film, all of which are owned by Toho Co. of Japan. Here's that brief statement from the final credits of Kong: Skull Island. "Characters of Godzilla, King Ghidorah, Mothra and Rodan created and owned by Toho Co., Ltd."
During Legendary's 2014 Comic-Con panel, which happened just a few months after Godzilla hit theaters, the studio confirmed that Godzilla 2 is happening, and that the iconic monsters King Ghidorah, Mothra and Rodan will be featured in this sequel. Legendary even brought Kong: Skull Island back to Warner Bros. from Universal, so they could bring the Godzilla and King Kong franchises together in Godzilla vs. Kong, which as of now doesn't have a writer or director attached. That may change soon, though, since Legendary is putting a writers' room together for both franchises. We reported in October that Krampus writers Michael Dougherty and Zach Shields were coming aboard to write Godzilla: King of Monsters for Legendary, with Michael Dougherty confirmed last month to also direct the sequel. Both writers were also put in charge of a writers room for both the Godzilla and King Kong franchises. It isn't known what other writers are a part of this writers room for both franchises quite yet, but we also reported last week that filming on Godzilla 2 will begin this summer in Atlanta, which gives the filmmaker nearly two years to work on the post-production phase of the sequel, hitting theaters in March 2019. It's possible that this post-credit scene will find a way to bridge the time gap between Kong: Skull Island and Godzilla 2, since Kong: Skull Island is set in the 1970s and Godzilla 2 will most likely be set in present day like 2014's Godzilla. 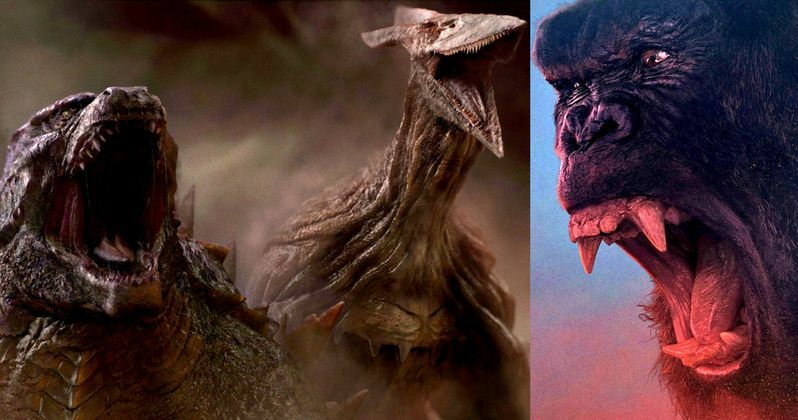 It remains to be seen if any of the giant monsters in Kong: Skull Island, known as the Skullcrawlers, will be seen in Godzilla vs. Kong or Godzilla: King of Monsters. Hopefully we'll find out more about both of these growing franchises after Kong: Skull Island hits theaters on March 10.